Before I start, I would like to introduce myself. My name is Kayne Johns, I am a sprint Freestyle swimmer, I have completed a Bachelor of Exercise and Sport Science, moving on to post grad study next year and I am also completing a internship at Melbourne Football Club (AFL) in the sport science department, focusing mainly on GPS and Load Management. Strength training can be used to help an athlete achieve their full potential. In some sports, especially swimming weight training must complement the work done in the pool by the swimmer. This is a critical factor when prescribing a strength-training program, as you shouldn’t exert high levels of fatigue outside of the pool. Swimmers can train between 15 and 30 hours in the pool a week depending on what type of swimmer you are (sprint, middle distance or long distance). Coaches need to understand the most beneficial way of prescribing a strength program. Swimming comes down to power (Pelot, 2012). Power = Work/Time, this is the amount of work done in a particular time; “Work” is the given distance of the event which doesn’t change. So instead of looking the above equation we need to look at it as, Time= Work/Power (Pelot, 2012). When considering this formula, the only way we could decrease time is by increasing power. Every swimmer has the aim of becoming the fastest they could possibly be, to achieve that the swimmer must be– efficient, powerful and fast. These three factors can all be improved by weight training. Creating a strength program is a form of art, there are hundreds of different ways to design a strength program, but following a simple method based on research with proven results is the key to improving a swimmers strength and power. Below is a table designed by (Pelot, 2012) showing two different training programs, Program A has a high volume, lighter loads and minimal rest periods. Program B is a low volume with high intensity and longer rest periods. These two programs produce different physiological changes in the body over a period of time. Program B would increase muscle strength and power, this would not increase fatigue like Program A would. If a swimmer is already completing 15-30 hours of training in the pool, their aim should be purely to increase strength and power, rather than to elicit more fatigue from high reps at lower intensity with short rest periods. Therefore Program B would be a more effective training program for athletes wishing to improve strength and power, but also minimise fatigue. These simple but effective variations could improve a swimmer’s performance in a competitive setting. Another example of an effective strength program would be to work off your 1 Repetition maximum. In swim training your sprint sets or thresholds sets are usually at a percentage of your best time, e.g 6x50m on 6mins holding PB +1 or 95%. So why shouldn’t you strength programs be the same?? A recent article published by Dan baker titled ‘Cycle Length Variants in Periodised Strength/Power training’ (Baker, 2007) explains the variations that can be used to effectively improve an athlete’s strength and power. Below is a part of a table taken from the article that shows how a Primary Strength exercise can be prescribed over a 12-week period to increase an athlete’s 1RM. With the aim of strength program being used to increase strength and power, then periodisation of certain exercises is crucial to obtaining maximum adaptations for the athlete. For a coach the best way to periodise strength training program would be via the force velocity curve as well as incorporating the above table. 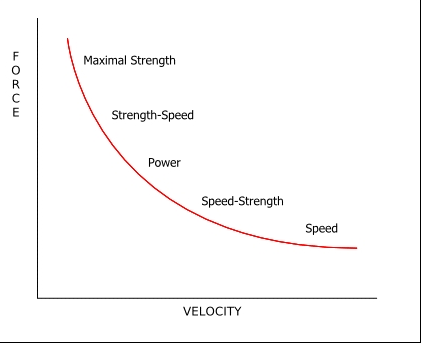 The force velocity curve is a great tool when periodising a strength program, the more force (e.g. the heavier the weight you lite (force), the slower you Lift it (velocity), inversely the faster you lift (velocity) the lighter the weight (force). Prescribing a training program similar to this for a swimmer would again be more beneficial then the Program A in Table 1, progression of a proper strength program would see increase adaptations in the athletes and improving performances. I’m not saying this is the only way to prescribe a strength program, as there are a million different ways to individualise a program, but you have to remember that a strength training session has to compliment what is done in the pool. If you are a sprinter who swims 50 to 100m, and you are doing large volumes (e.g German volume training of 10×10) in the gym, excluding conditioning programs such as Strongman, skipping, boxing. You need to confront your strength coach and ask why you are doing this? Everything has to justified! Just because your race might last between 22 and 55 seconds depending on the event, doesn’t mean you need to be completing body weight exercises for a similar time frame. That’s why you train in the pool, you do your sport specific training in the pool and in the gym you strengthen the muscle groups used for your event. I’d also like to talk about when strength training should be completed, if your goal is get stronger; you should be completing your strength program prior to getting into the pool. Cardiovascular training can make your blood more acidic, with excess hydrogen ions building up in your blood, thus leads to muscle fatigue, reducing the ability to forcefully contract your muscles (Fischer, 2014). Injury prevention – technique is an extremely important factor when lifting weights at a percentage of 1 rep max. If the stabilising muscles are weakened due to fatigue, this might lead to incorrect technique and therefore the potential for injury increases. Lower energy stores post training may lead to fatigue and therefore you may not be able to lift what you are capable of (Fischer, 2014). This information I have provided isn’t the only way you will see benefits from your training program. But I have briefly outlined some of correct methods based on research on how to effectively periodise a strength program that can compliment training in and out of the water. You don’t need to reinvent the wheel with some special exercise or program. Basic programming works. Baker, D. (2007). Cycle Length Variants In Periodized Strength/Power Training. National Strength and Conditioning Association , 10-17. Baker, D. (2005). Methods to increase the Effectiveness of Maximal Power for the Upper Body. National Strength and Conditioning Association , 24-32. Layne, J. E., & Nelson, M. E. (1999). The Effects of progressive resisitance training on bone density. Medicine and Science in Sports and Exercise , 25-30. Pelot, T. (2012). Strength and Power Training for the elite swimmer. Olympic Coach Magazine , 1-10.